“Dancing with My Shadow.” Composed by Harry Woods for the British musical comedy Thank You So Much. Recorded by Elsie Carlisle, probably with the Embassy Rhythm Eight, on February 5, 1935. Decca F. 5436. And making believe it’s you. This slow foxtrot was composed by Harry Woods for the British musical comedy Thank You So Much. Woods wrote other notable songs that Elsie Carlisle recorded; one thinks particularly of “The Clouds Will Soon Roll By.” The song also notably appeared in Alfred Hitchcock’s 1935 film adaptation of The 39 Steps. Elsie Carlisle, veteran torch singer, interprets the lyrics masterfully on this record, which she appears to have recorded with the Embassy Rhythm Eight, who went uncredited; this identification is strengthened by an examination of the sequence of matrices on the records they recorded with Decca on the same day. 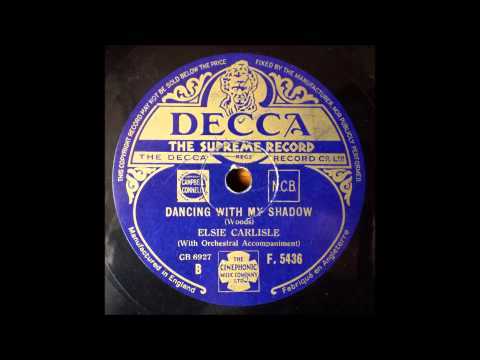 “Dancing with My Shadow” had been recorded in the United States the previous year by Richard Himber and His Ritz-Carlton Orchestra and by Joe Reichman and His Orchestra (with vocalist Paul Small). In Britain in early 1935 there were versions by Billy Cotton and His Band (with Alan Breeze), Harry Roy and His Orchestra (Ivor Moreton, vocalist), the Piccadilly Hotel Band (with vocalist Jack Plant), the New Grosvenor House Band, Joseph Swindin and His Boys (Frank Gough, vocalist), and Harry Leader and His Band. The song was even popular in Swedish and Danish translations.